My last post about this funny issue mentioned two posts earlier. In spite of the hard blogging efforts in climaterealists, may did not seem to be cold at all as explained in the mentioned post. However , just in case, I am going to use the IR temperature data from University of Alabama in Huntsville. Those data are compiled among others by Roy Spencer and are somehow controversial but they are accepted, adopted and frequently used among skeptics, but they are global and are published very fast online, so they are useful for the purpose of this post. This data source confirms not only the quite hot global temperature (fourth hottest on its records) but also the world map distribution. In effect was colder than average in some parts of Australia, in a small part of Alaska and some parts of the oceans, but it was average or hotter than average elsewhere, concretely in USA and Europe, including Britain. It was really hot in some parts of Russia. 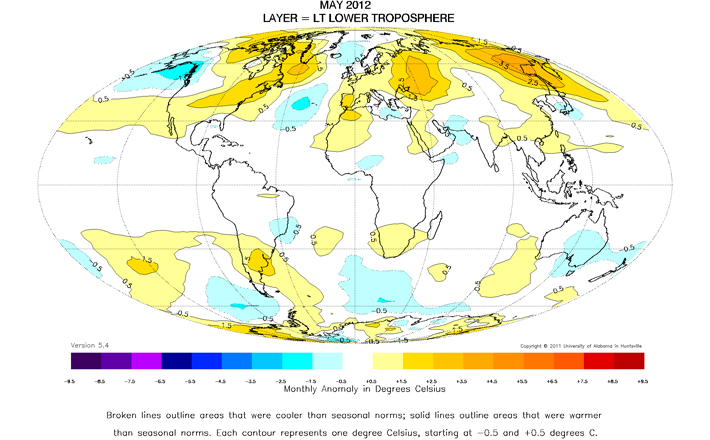 The figure below displays nicely this world map of “the coldest may”. The question is: Considering the very low-level of autocriticism in climaterealists with this issue, and how they have just forgot it except this partially justifying post, do the rest of the contents of that blog worth a reading? It this the standard of quality or scientific rigor in skeptic blogosphere? At least in some cases it is.